© 2018 ShopPad Inc. Privacy and Terms. Shopify Plus is a hosted eCommerce platform that provides high volume businesses with a solution on which to build their online storefront. It launched in 2014 as an extension of the original Shopify platform and now leads the way in cost efficiency, security, ease of use, community, and flexibility. Shopify Plus powers over 3,600 merchants, including many hyper-growth DNVBs such as MVMT and Kylie Cosmetics. Before diving into the nitty-gritty details, let’s go over the high-level facts for why you should be considering Shopify Plus. You can scale your business quickly and easily with Shopify Plus. The platform was built with growth in mind so you won’t run into any technical hitches along the way. You can kiss goodbye to worrying about your site going down during major sales. Shopify Plus saves your business money. Because the platform is hosted, you won’t need a team working on your server and backend code. You also won’t need to spend time figuring out how to integrate your software solutions or how to get up and running with things like retargeting ads. Shopify’s virtually endless app store and partner program take care of all those things for you. Shopify Plus is the most user-friendly and customizable hosted offering on the market. Shopify comes with all the core features any eCommerce needs, with access to a massive app store and partner network that enables a store to create the exact software solution they need, rather than having to work with something that’s completely pre-set out of the box. The business world has been trending towards automation of repetitive processes. After all, automation is scalable like nothing else. So in response to this demand, Shopify released two powerful tools: Shopify Flow and Shopify’s Launchpad. Shopify Flow, a backend automation tool that, as of this publication, is head and shoulders above anything else currently available in the eCommerce industry. Flow allows you to automate backend busy work so you can focus on expanding your business and trying out new strategies without losing productivity. Tag and segment customers for you based on their buying behavior or ask them to leave a review. Automate inventory management processes, including reordering low-stock products. Standardize your merchandising and product organization. Pause ads for inventory that’s low and notify your marketing team. Track and automatically reward your customers based on their lifetime spend. Flow can even automatically cancel high-risk orders. Shopify Flow does not just automate workflows internally, Flow can also automate the movement of data between supported applications and Shopify. Currently, there are 24 supported applications with Shopify Flow. You can schedule your products and promotions to publish across multiple sales channels at once, meaning you don’t have to go through each channel individually. You can create preset discounts for specific products or even complete collections. You can design campaign themes ahead of time and schedule them to update automatically. And of course, you can pre-schedule all those changes to return to your standard form at the end of the event. Automation is certainly key to scaling your business and saving time on unnecessary manual work. Shopify Plus makes scaling your business bigger than simply automating manual workflows. The Plus platform also provides merchants with a way scale to their business globally. Ability to integrate with your ERP, 3PL, OMS, IMS, and the other business systems that you rely on. AvaTax, a tax automation service provided by Avalara, is included at no additional cost to Shopify Plus merchants. Fraud Protect, which is a new feature. Fraud Protect is built off Shopify’s machine learning, which studies the thousands of businesses using Shopify to prevent fraudulent orders from hitting your system. Shopify is so confident in the accuracy of this feature that they guarantee your money back on any fraudulent sales that may slip through the cracks. Global CDN’s for speed and functionality. Shopify Plus has built-in analytics that can advise you on when and where you should expand your business to. Multicurrency checkout, enabling you to sell and settle bills in local currency. (At the moment, it supports nine major currencies, including the US dollar, the Euro, and the Hong Kong dollar with plans to continue expanding this list). Expansion stores to enable you to quickly launch up to 9 different sites (many merchants use these for localizing their products to sell in international locations). Backend translation allows stores to operate in the native language of their employees. Shopify takes the success of their merchants very seriously. After all, your success is their success. Because of that, Shopify provides Plus merchants with a well-trained team of experts devoted to making sure you can get the most out of the platform. You’ll start by working with a Launch Engineer who will make sure that the debut of your new Shopify Plus store goes smoothly. They are the ones who will help test your site and train your team on how to use the platform effectively. Your Solutions Engineer will work with your technical team to ensure that all systems work seamlessly with Shopify and work through any development questions. Believe it or not, there’s one more person Shopify Plus gives you: a Merchant Success Manager, who will work with you one-on-one through your launch and growth to make sure you're hitting your goals. They’ll be there not only to guide you through learning the platform, tools and ecosystem but also to help you strategize. All these resources allow Shopify to boast a standard onboarding period of 3-6 months, rather than the 8-12 months that’s the industry standard. Shopify Scripts are written in the Ruby language, allowing your developers fine-grained control and flexibility. Line item scripts. These allow you to affect changes to the line items in a cart. You can use them to create complex promotions (BOGO, free gift, tiered discounts, etc), change prices, and offer discounts. Shipping scripts. These scripts all you to change shipping methods, offer in-store pickup and free shipping based on the criteria you define. Payment scripts. These scripts enable you to rename, hide, default, and reorder payment gateways. Shopify has a robust API, as one would expect from a solution that integrates with so many third-party apps. Standard Shopify plans have a 2 call per second rate limit and allow bursts up to 40 calls using what is known as a "leaky bucket algorithm." Shopify Plus doubles these limits, allowing you up to 4 calls per seconds with bursts up to 80 calls. Shopify is a completely hosted solution with an impressive and industry-leading 99.98% uptime. Being a hosted platform means that Shopify will store and run everything on their massively global network of servers, rather than yours. It also means that you can access all your Shopify systems from any internet-connected device. On vacation at a tropical beach but need to check your latest reports? No problem. Just log in on your phone. Black Friday of 2018, Shopify stores worldwide generated $37 million in sales per hour - and not one store crashed. Death Wish Coffee was able to sell $2,083 per minute after their Superbowl commercial aired without the website going down. And don’t forget how the Kylie Cosmetics website completely sold out within in one minute of launching its website. Most brand new stores would not have the capacity to keep a website up under that kind of duress. And Shopify’s continued to power Kylie Cosmetics traffic spikes with aplomb, like the time 200,000 people simultaneously went on the website during a pop-up event in NYC without a hitch. Shopify Plus offers its merchants the ability to integrate any of their 20+ supported sales channels. This can be anything from Facebook Messenger, your long-standing Amazon account, or even your current POS system (put a pin in that). What’s awesome about Shopify’s multi-channel selling capabilities is that you are able to sync your prices, fulfillment, and inventory across all your channels from a single location, rather than having to update these separately. Allow your customers to easily repurchase from their order history. Create custom pricing, including minimum purchase amounts, both for individual customers or groups. Enable discounts easily, including volume-based discounts. Prefer negotiating your deals for custom pricing? Shopify Plus makes it possible for you to review orders before you send an invoice. Shopify Plus allows you to set minimum, maximum, and quantity increments per product - perfect for wholesalers. While Shopify’s POS is accessible to all Shopify users, it is still worth mentioning in this guide. With Shopify POS, merchants can quickly launch physical stores attached to their online store whether it be a pop-up shop or a more permanent storefront. Shopify’s POS contains all the modern features expected for a POS, but most importantly, it is seamlessly integrated with your current admin and inventory systems. It should be noted that, like the eCommerce solution, Shopify’s POS comes out of the box with all the core features, but unlike other POS systems, Shopify also gives you the ability to customize it via the Shopify ecosystem. Perhaps one of the most important things about Shopify in general, not just Plus, is the diverse ecosystem that Shopify has built up around itself. This ecosystem allows Shopify to extend its core eCommerce product in practically infinite directions, creating stores as unique as merchants can dream them up to be. The ecosystem is built into three sections: themes, the App Store, and the Shopify Plus Partners. Shopify makes customizing your store a breeze in many ways. One of the ways they make it easy to get started is by offering pre-made themes for your Shopify store. They currently have 67 of these premade themes, ranging in price from $0-$180. If you are not familiar with Shopify or their themes it is worth exploring the difference between custom themes and standard (premade) Shopify themes. When it comes to Shopify, if you need something, there really is an app for that. Shopify is well known for the ecosystem of app extensions they have grown. Shopify boasts a whopping 2,000+ apps in the app store. All these apps allow you to endlessly customize exactly what you need to your Shopify store to be able to do, without overloading the basic system with features that many merchants won’t be able to use. Apps will be a charge on top of your existing Shopify fees, but there is a wide range of cost from $0 well into the hundreds of dollars per month. Merchants who choose to use a Shopify app will more than likely be billed monthly directly in their monthly statement from Shopify. However, some services offer the ability to be billed annually directly through their own service. These thousands of apps cover a wide range of categories from your store design to your marketing, from orders and shipping to security. Check them all out here. Need something more that Shopify isn’t able to give you? Shopify has a global network of talented partners to help you customize your store. As a Plus client, though, you’ll have access to Certified Plus Partners. This elite group is the top 1% of all Shopify Partners. You can see the full Shopify Plus Partner list here. Shopify Plus pricing model is split between platform costs and transaction costs. Base pricing for Shopify Plus starts out at $2,000/month for businesses doing under $800,000 in monthly revenue. If your business is exceeding $800,000 in monthly revenue then you can expect to pay a 0.25% fee on all eligible transactions. $2,000/month winds up being only 1% of your revenue if you do as little as $300,000/month. John Doe’s averages $340,000 in monthly revenue with a peak season in the summer. May in-particular is John’s biggest month bringing in $920,000, with no other month ever exceeding $800,000 in revenue. For every month, except May, John is only paying $2,000/month for Shopify Plus. In May however, John payed $920,000 * 0.0025 = $2,300. John’s annual cost for Shopify, therefore, is ($2,000 * 11) + $2,300 = $24,300. John is doing roughly $4,080,000 in annual revenue which means Shopify Plus costs only 0.005% of his business. Shopify integrates with over 100 payment gateways allowing you to accept payments from all over the globe, including Amazon Pay, Quickbooks Payments and SagePay. For a complete list of supported gateways, see here. However, Shopify also offers Shopify Payments, which they incentivize you to use by waiving Shopify’s additional transaction fee for using 3rd party payment gateways. Regardless, you still need to account for the rates the credit card company is charging through the payment provider, whether you use Shopify Payments or a 3rd party system. The credit card rates you will pay will vary from provider to provider. .15% Transaction fee charged by Shopify on top of other fees. Shopify offers Shopify Shipping, which allows merchants to fully manage their shipping logistics without having to leave Shopify’s system. You can do everything from order fulfillment to purchasing your shipping labels right from within Shopify. Cost for using any application required to run your business on Shopify Plus. Application costs can vary from free to upwards of $2,000 a month or more depending on exactly what you need. Costs for design and development on your Shopify site, whether launching your site or redesigning an aspect of it. This work can cost from the low thousands to over $500,000 depending on the scope of your requirements. While cost is surely an important factor in your evaluation process, it shouldn’t be the only consideration. For most merchants, the savings in moving to Shopify Plus is undeniable and generates quite a strong ROI. The next thing to investigate is how the solution has performed for real users. “What do you like best? I have a lot of experience working with eCommerce platforms. I've been very happy with Shopify Plus from the start. To be honest, I was a bit skeptical at first of the benefits we may receive over regular Shopify since my experience there was great as well. We now have 4 stores running Shopify Plus and I have been beyond impressed with the support we have received. The customer service and dedicated Account Managers are always extremely helpful in finding ways to achieve any goal or offering support with integrations.Another huge plus that comes along with the exemplary support is that our technical team can stay small during the early stages of our growth by not having to have a massive in-house team for managing our websites. His complaint that Shopify Plus seems limited in terms of customization is common throughout the G2Crowd reviews, though nearly all the reviewers acknowledge that they can achieve all the customization they want through the Shopify ecosystem. On TrustRadius, Shopify Plus receives a 9.1/10. Read all the merchant reviews here. The stand out review I’m featuring here is quite exhaustive, so I’m only sharing the highlights. Read the complete review featuring other products considered and even ROI here. The review is by an anonymous verified user and is titled "Shopify is the unquestioned market leader for hosted eCommerce." Pro: Scales incredibly well. Forget about hardware concerns, load balancing, downtime, etc. and focus on eCommerce. We've seen merchants go from a few thousand dollars per month to having million dollar days, all on Shopify without having to worry about performance or scaling systems. Pro: Great new features consistently being added, ahead of the curve on almost everything. Pro: Solid API to build on and work with, a few annoying quirks here and there for super complex use cases but overall very well documented and works well. Pro: Most Merchant Success Managers are good and genuinely want to be helpful. Pro: A fantastic user interface, very logical and easy to use. Pro: Tons and tons and tons of out of the box integrations. Easily the best integration marketplace of the e-commerce platforms. There's an app for that. Con: Some very enterprise features are missing. Vaulted credit cards only work via the Shopify Pay (different than Shopify Payments) and aren't saved to customer accounts. Probably in part because of this, recurring subscriptions are not possible without using third party apps which is super annoying and those third-party apps hijack the native Shopify checkout so that they can take you to their checkout where they can actually save the cards. Shopify does not seem motivated to change this anytime soon either. Con: Some merchants are frustrated that they have to use apps for functionality that they would otherwise consider essential such as wishlists. Shopify would argue that they are best as a platform and would rather empower apps as that results in an even better user experience since there are options for different apps, app developers are more incentivized to go deeper and build better, etc.. In most cases I believe this works well. “Pros: This is hands down the easiest platform to use if you are looking to get an eCommerce site up and running quickly and have it look/work right. Tons of plug-ins to help increase conversions. Cons: Can be cumbersome at times if you get into the CSS. If you are an advanced user though it becomes a non-issue. Overall, as you can see, merchants love Shopify Plus, finding it easy to use with great customer service. The downside mentioned repeatedly is that you need to work within the ecosystem to customize your platform, but they also all tend to acknowledge that Shopify is very upfront about that. Shopify intends to sell you a core platform, without boatloads of bells and whistles you may not need weighing it down. They then make it easy for you to find the exact bells and whistles you need within the ecosystem." We obviously think that Shopify Plus is the best solution on the market for enterprise retailers, but we would be remiss if we didn’t touch on Shopify Plus competitors. Like Shopify, it’s a hosted solution, seeking to offer an easy-to-use interface. One of the major differences that should be noted is that Big Commerce seeks to load its platform with features, while Shopify, as mentioned, offers a strong core and relies on its powerful API's and large ecosystem for individualization. 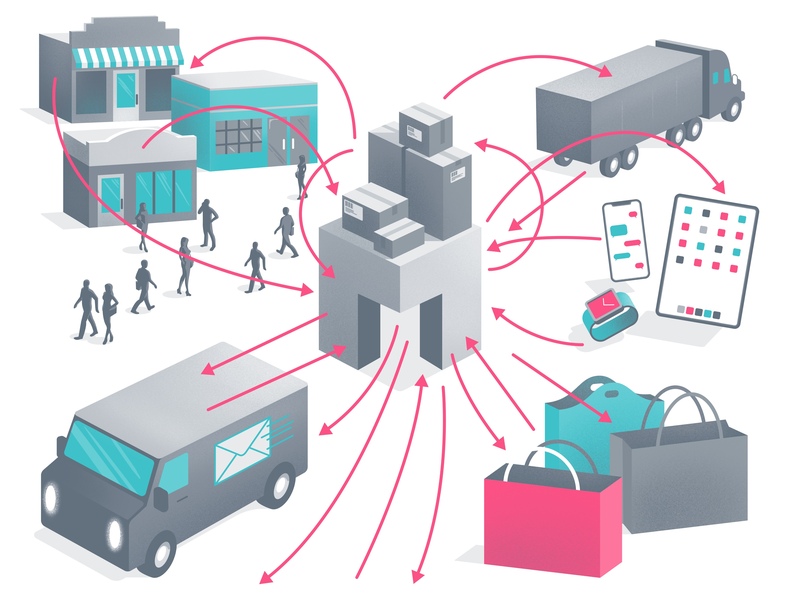 This means that for some businesses Big Commerce may end offering more out of the box - but you need to be a business with the exact model Big Commerce was built for. Magento is an early open-source solution for eCommerce stores and for a long time, it was the leading solution in the industry. Because Magento is software, not a service, Magento will not be a breeze to use out of the box. This means that you need to be concerned with the hosting, maintenance, and authoring much of your store’s coding. There are also some big differences between the two solutions from a developer’s perspective, which we discussed here. Magento could be the right fit for you if you’re able to do all the heavy lifting. Hybris is a sprawling hosted eCommerce system that’s been around since 1997. It’s a modular system with five sections: commerce, billing, marketing, sales, and service. Merchants can pick and choose amongst these five sections to build a semi-customized system. Hybris has the potential to be an extremely powerful system, but it’s also an older system. To be fully utilized by a business, it requires a large amount of upfront cost and effort. Its modules also allow for only so much customization, so unless your business runs exactly the way Hybris was built for, you’ll be paying for features you aren’t using and/or missing features you need. That said, Hybris may be exactly what your business needs if you have a model that fits their build. Netsuite Commerce is a hosted eCommerce solution as well. At one time it was considered one of the premier eCommerce systems for high-volume businesses. Its days may be passed though, as many reviews for the system reference it’s clunky, outdated interface and lack of customer service. It does still shine in the area of integrating an established retailer’s many back-end systems, locations, factories, and warehouses, though, so it’s still a system that should be considered by companies who meet that criteria. Whether you are a B2B, B2C, or both Shopify Plus makes it easy to handle your needs as a merchant. While this document can serve as a high-level single view to evaluate Shopify Plus, it is worth having a conversation with one of their Shopify Plus Consultants. If you're already a Shopify customer who's thinking about upgrading, click here to read the 6 Signs It's Time to Upgrade to Shopify Plus. Here at ShopPad, we have a great relationship with the Shopify Plus team as one of their most technical partners and one of the top 1% of Shopify development agencies. If you are interested in talking about a new site on Shopify Plus you can tell us about your project here. Dustin is an Account Executive at ShopPad. He loves eCommerce and has worked with merchants LARGE and small. He knows that in an environment controlled by the likes of Amazon there has never been a better time to optimize your retail strategy and get the online piece right. When he is not working, Dustin is probably enjoying all the fine dining in San Francisco! Get the digest of new Shopify apps delivered every Tuesday. Join the list that 97,000+ merchants who keep on top of the very latest from the Shopify Apps store.